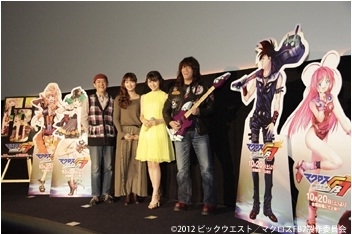 On November 11, 2012, a special screening of Macross FB7 was held at Shinjuku Picadilly Cinema which included a talkshow by director Tetsuro Amino and special guests Aya Endo, Megumi Nakajima, and Yoshiki Fukuyama. The timing of the event was unusual in that it took place a whole two weeks after the movie debuted on October 20 and talkshows such as these normally happen on opening day. So, what did Amino have to say about the movie? Hit the jump below to find out. Be warned the following contains SPOILERS. The following is an abbreviation of the discussion that took place between the guests. The entire thing will be included as an extra on the DVD/BD release which will be released on April 24, 2013. The talkshow was MC’d by Osamu Kobayashi who is no stranger to anyone who frequently attends anime-related events in Tokyo. He regularly hosts such talkshows, as well as the Yamatalk events and media-oriented events like the recent Ghost in the Shell ARISE unveiling. MC Kobayashi ushered the guests onstage to much applause and introduced them. Funnily enough, Fukuyama mentioned that this was his first time speaking at a movie talk show so he was fairly nervous. Who would have thought that speaking in front of a room of cinema patrons could be more nerve-wracking than playing to crowded live houses? MC: What impressions did you have when FB7 was initially conceived? Amino: Well, the plan initially got off the ground and was kicked around a bit before I heard of it. When I did, I thought it was a fairly hair-brained project but that that was probably why it landed in my lap. To be told put something from 18 years ago together with the present day – put simply, I was surprised. Endo: When I heard about it, it was already mostly done and I wondered when on earth they had found the time to put it together. In the Frontier tv series the Firebomber is mentioned its songs are used so it’s not like the series are totally without any connection, but I was pretty surprised, an happy, when I heard that the two would come together as a movie like this. 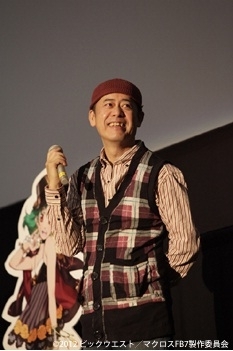 Nakajima: As a fan, since its Macross’ 30th anniversary, I thought there might be something, but when I heard that 7 and Frontier would be brought together and that Ranka would be involved, I was honestly very happy. I was also excited to find out how they would be able to transcend time and space and how they would meet. Fukuyama: I was surprised when I heard that a series and OVA from 18 years ago was going to be turned into a movie. Actually, there was a (Macross 7) movie back in the day and I snuck into the theater to see it. I did the same for this one too, at this very cinema. Not on this screen, but on screen 11 or something like that, although some people recognized me on the way out. MC: What were your impressions of Macross FB7? Fukuyama: It felt much the same as when I watched the original, although I knew what was happening this time so when I heard my voice I thought ‘ah, this is the part that’s my song.’ I thought to myself that Basara really gave it his all 18 years ago and was cheering him on, so it was sort of like being at a concert. MC: (To Amino) What sort of concept did you have in mind when putting FB7 together? Amino: Well as I said before, at first I was surprised and wondered what I could do. Basically, the theme of the movie was ‘Discovery.’ I thought of various approaches, like starting by having Ozuma listening to ‘Totsugeki Love Heart’ while in his car and having him then search (for what happened to Firebomber) and then connecting this and that together, but this way meant that the movie would have been really long and wouldn’t have left much room for our female characters to do much, so in the end I had most of the digging around being handled by Gavil. In this way we pieced the footage and songs together – and in Macross 7, all you really need in the music – and eventually put it together in a way I felt good with. MC: What does the title ‘FB7’ stand for? Amino: Well the stories of Macross are connected by what I think are these important threads of fate and… at first I was conflicted over what to call it. I thought since it was Fire Bomber then we could use ‘FB’, and then I realized the F could also be for ‘Frontier’ so I thought that we could go with ‘Frontier Bomber 7.’ And while that became its official title, it could also stand for ‘Fukuyama Band.’ That works too. So I’ll leave it up to the audience to decide for themselves what it stands for. Amino: That works as well! MC: Well that’s how I’ll think of it from now on. Of course, it stands for ‘Fukuyama Band’ as far as Fukuyama is concerned, right? MC: (To Endo and Nakajima) What it feel like going back to the recording booth to play these characters again? Endo: I didn’t really know how they were going to incorporate my lines or imagine what context they would be used in until I finally got to read the script. Then I understood how the characters would be looking back at history and at Firebomber in a way that fit in as a part of their daily lives. We did the recording sessions at the same studio we originally recorded Macross Frontier at – I was even in the same seat at the same microphone, as Ozuma (Katsuyuki Konishi) noticed, as was pretty much everyone else. It was really nostalgic and brought back a lot of memories and, even though I had changed a lot since then, I was really happy to be able to go back and revisit the same character. Nakajima: Five years had passed since Macross Frontier tv series and it felt like it had really been a while since I’d last worked with everyone else from the cast and shared that Macross feeling in a studio together. So when I first opened the door of the studio, it felt as though I’d gone back in time 5 years. I actually became a bit nervous. Before my debut in Macross Frontier, I had watched Macross 7 on DVD so to now be recording lines while watching that same footage I was nervous as I was back then. MC: (To Fukuyama) We just saw your new song on-screen. Could you tell us a little bit about it? Fukuyama: Of course. Chie Kajiura and I didn’t get the chance to actually record together in the studio back when we originally did Macross 7. We recorded our songs separately and didn’t hear ourselves singing together until the show was broadcast. Then, 3 years ago, we got to record together for the first time when we did a new Firebomber album and were able to do a duet. Back in the day, there were lots of songs that ended up being duets even though we hadn’t originally recorded them that way. This time, the song was planned as a duet from the beginning so there was a feeling of ‘we’re finally doing a duet!’, and it was a lot of fun. MC: How did it feel singing as Basara again after 18 years. Had anything changed? Fukuyama: Back when I first did Macross 7, I actually went ahead and started doing songs after having only met the director once and didn’t really know what was what. So I never sang in a way that I thought was specific to the character. So, similarly, this time too I just sang as myself. MC: So your natural singing voice was pretty much Basara? Fukuyama: Yes, that’s correct. So even when I did songs for other projects, I didn’t do anything differently. MC: (To Amino) How did it feel, hearing a new Firebomber song? Amino: When I first heard Virgin Story it felt very nostalgic and was overwhelming – I actually shed a tear. As those here today already know, the last shot of Basara is one where he is actually crying, to convey the fact that ‘even Basara can shed tears.’ Unfortunately the print isn’t all that clear and it’s difficult to see though. MC: What was it like covering a Firebomber song? Nakajima: I would never have predicted that this day would ever come. Having my voice mixed with Fukuyamas and Kajiuras – it was like a dream. I was nervous because it was going to be released on CD. Fukuyama: Once it was finished and I went back and listened to it, it felt like we had really become a band so I was happy. 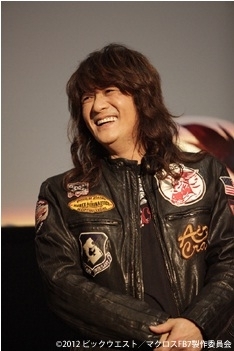 Nakajima: I was nervous when doing both the acting and singing. The medley, being made up of songs from the legendary band Firebomber, felt like something very important. May’n and I wanted it to adequately convey respect (to the original) and the songs personality in a way that would reach Basara and Mylene. MC: Personally speaking, just the beginning alone – having Ranka lead in with that count-down, brought me to tears. That’s what us Macross fans are like! Especially when hearing THAT countdown at the end! 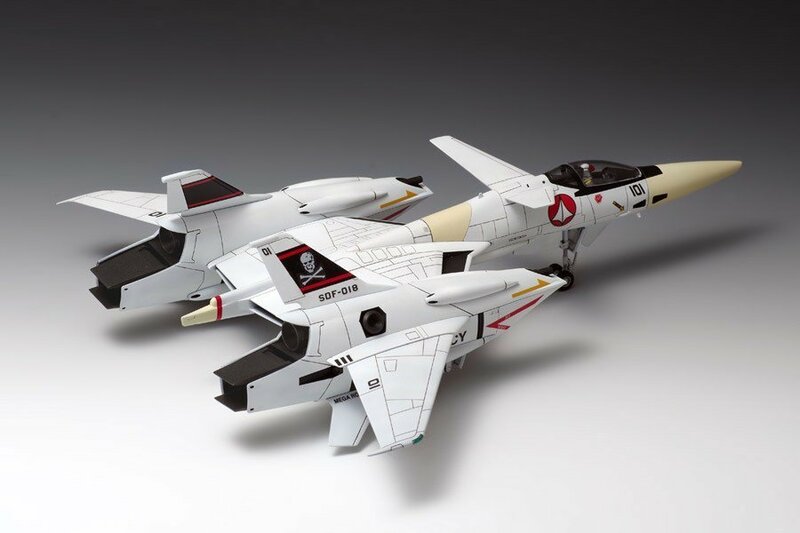 And there are various elements from Macross that have been included. Amino: Well it IS the 30th anniversary after all, although it’s not like I chose all those elements myself – many of the staff were involved and, after hearing their opinions and ideas, we added various elements including the ending countdown. 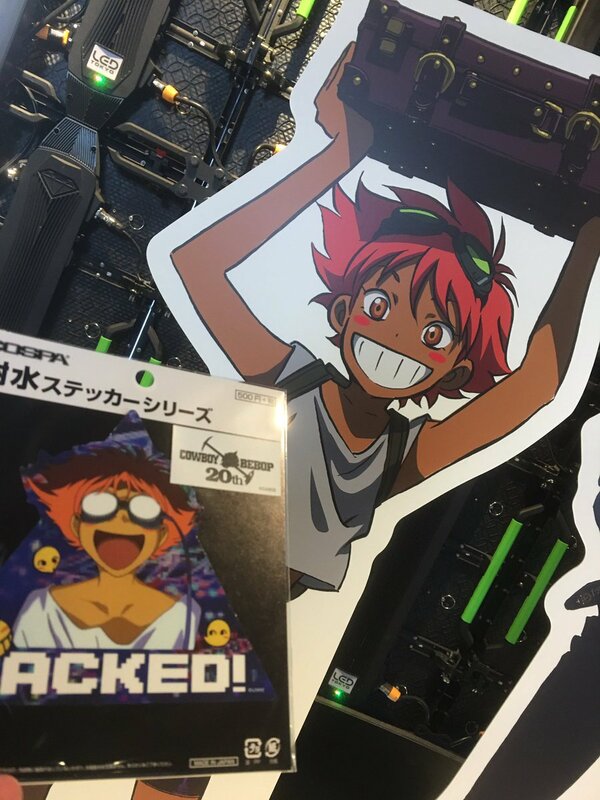 MC: For fans of Macross 7 as well – the Flower Girl, etc, there are parts that bring back memories and others where people may notice what has been cut. As director, wasn’t it hard to cut down such a long series? 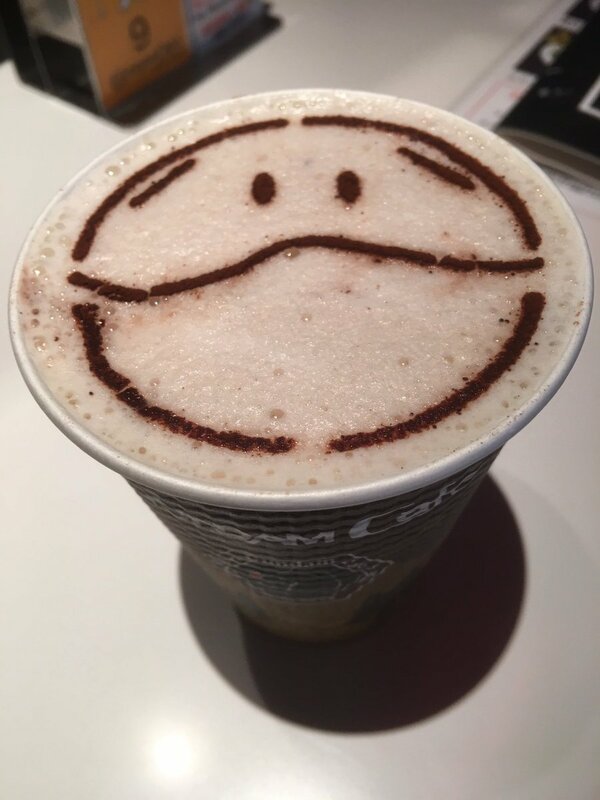 Amino: It wasn’t a case of it being difficult, I realized from the beginning that it couldn’t be done! That’s also why it was fun to make. I knew I could tick off some people by cutting certain parts and also included some scenes that didn’t necessarily need to be left in. In a way it was a lot of fun! MC: Of course, there will be many newer Macrsos Frontier fans who haven’t seen Macross 7 who will see FB7 and think ‘so THIS is the sort of show Macross 7 was’, right? While introducing Macross 7 to those who don’t know it is indeed one of FB7’s goals, Macross 7 is actually a show that defies explanation. Thus, the goal was also to try our best to explain to people that the show couldn’t be explained. (To Endo) What do you think of the character of Basara? Endo: Well, I’ve already watched FB7 because I knew I’d be involved todays talkshow and wanted to be prepared but, during the recording session, I found that Basara was much cooler than I’d expected. Since he had so many singing scenes he came across as passionate…almost too passionate, although I don’t mean that in a bad way. It was obvious that, more than trying to sing his best, he was trying to do what came naturally. Watching his character just felt good. Also, since I had originally seen Macross 7 when I was a kid, and to revisit the character of Basara as an adult – well as a kid I didn’t think that much of him. He was a guy that sang. But as an adult, I can … how do I put this….appreciate his straightforwardness. It was interesting how my impression of him changed. MC: So, because you’ve grown up and changed, revisiting the show gave you a new impression of it? Endo: That’s right. It was sort of odd to realize that I now had this (different) impression. And, you know, Basara is kind of cool. MC: We are almost out of time today, so I’d like to ask one final question. While those here today have, of course, just watched FB7, if they were to watch it again, is there anything in particular that you recommend they pay attention to? Endo: I’d have to say the final concert scene where the cast of Frontier are singing as Firebomber. The whole show is connected to and leads up to this point. So if you (re)watch knowing that that scene is what it is all leading up to then I think the way you view it changes and you really get into it. Nakajima: From the very beginning, if you pay attention to what characters say and the little changes, then I think you really get into it, like Endo-san said. At the very beginning, Ranka is like ‘Firebomber? That’s that band that my brother likes, right?’ And from that starting point things get bigger and bigger until you get caught up in it. 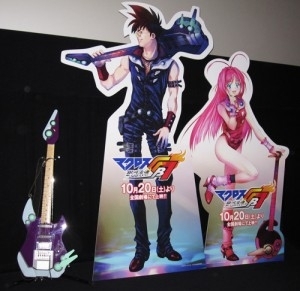 The movie shows the power that Basara and Mylene have to capture the imagination and I hope that this makes people want to watch it again and again. Fukuyama: Basara is made up of a lot of things, but to me he is someone that sings while getting punched, gets the spiritia sucked out of him to the point that his voice (actually, Nobutoshi Canna’s) changes – even now when I watch it I don’t fully understand everything so if you are like me, then I recommend rewatching FB7. Amino: To start off .. this isn’t something you should only watch once! Those who have only seen it once cannot truly say that they’ve seen it! It’s something meant for repeated viewings. It’s like a movie, but it’s not a movie. Personally, I call it a ‘Rock Show.’ Rather than satisfy the viewer in a single viewing, it’s meant to be watched multiple times so the viewer can find those songs they like and know when to expect them. Anticipate them. Then, I think people will be satisfied and can finally claim to have ‘seen it.’ Until you reach this point, you should keep rewatching it. In the past I watched a lot of movies and those with lots of songs in them aren’t necessarily musicals. When it comes to movies with lots of songs in them I tend to watch them over and over. The joy in watching them comes from reaching the point when I know and anticipate the next song. The same goes for FB7, so please keep watching it.